If you’ve spent any time treating clients for their smoking habit, you’ll be familiar with that ‘ganged up on’ feeling. You know: the sense that you’re actually fighting the smoker in your treatment room, rather than helping them. And that they’ve got backup fighting for them too – the cigarettes. And it’s so frustrating isn’t it? They’re arguing against their own health – their own life, but you can’t see a way through the addictive defence shield. Although your smoking client came to you asking for help, their addiction grants them artfully creative ‘logic’ to justify their habit, dismiss their ability to stop smoking, resist your ability to help them, and keep on smoking. No matter what you try, whatever ‘punches’ you throw, one or both of your opponents is ready for you. It’s human nature. Even your client’s most unreasonable and self-defeating excuses seem perfectly reasonable to them, because the maddening (to you) behaviours that surround addiction and habit operate on an unconscious level. Which is why, despite its critical importance to the client’s health, smoking cessation treatment can feel to the therapist like a never-ending crusade. When you learn how to sidestep all resistance, it’s like dropping your end of a tug-of-war rope. The struggle ends and you can then help them turn that resistance against the smoking habit and pull together to defeat the real enemy once and for all. When you learn ‘How to Stop Anyone Smoking’, you’ll start by gaining an empowering new mindset for yourself about smoking cessation. This new way of thinking will obliterate your old beliefs and give you a fresh understanding of how smoking works. Armed with this new Uncommon Knowledge, you will see your smoking clients’ habitual behaviour through a fascinatingly clear lens of understanding. No longer will the rationale for their responses, actions, and arguments be perplexing. And the steps you need to take with them will feel so obvious, you’ll be amazed you didn’t see them before. We all know that attempting to argue away beliefs is like hacking away at the stems of garden weeds; they may back off for a time, but until you exterminate the root, they’ll continue to choke off positive new growth. This is why How to Stop Anyone Smoking teaches you how to work at the unconscious level to change the smoker’s attitude towards their habit. Another key element of the Uncommon Knowledge smoking cessation system is the awareness that rapport is everything in therapy. The approach we teach enables you to maintain high levels of rapport with your client throughout the smoking cessation process. You and your client will feel you’re fighting together against the cigarettes, rather than you struggling with your client over an attempt to steal something they love. Just imagine how this will revolutionize your experience with smoking clients. Often our graduates find they only need one or two sessions with a client to free them of smoking. But if your client relapses, there’s no need to be filled with dismay and have your self confidence shaken. If your smoker does relapse, you’ll know how to steer them gently back to the non-smoking road using the tried-and-tested responses we’ll teach you. I found the course fantastic, it really explained the psychology and physiology of smoking/smokers. After the course I studied all your scripts in depth and formulated a foundation script that I work from. My session lasts 1.5 hrs and I have had a 100% success rate after only 1 session. My confidence grew after the first few successes and this does make a difference in how you go into a session (I still listen to your audio “success with smokers” at least once every few weeks. The positive re-framing flows more easily now when people are doubting if the therapy will work. Jim had one 1.5 hour session with me and left my clinic as a non smoker. I saw him a couple of weeks later for a short follow up, not because he had resumed smoking but because he was fidgeting as he didn’t know what to do with his hands. I phoned him a few times as a follow up to see how his health was – he was enjoying regaining his health. A year or so after his session, I received a postcard from Jim from Rome, with a big “Thank You!”. He said that he diligently placed the money he would have spent on cigarettes each week into an bank account (cigarettes in Australia cost around $20 for a pack of 20). In this time he had saved around $20,000 (a staggering revelation). It was the first time that he and his wife had afforded to travel and they had always wanted to go to Italy. He has been to see me for some healing sessions since his return – looking healthy and with the grin of a Cheshire cat! He is a great example that it is never too late to give up cigarettes and take up living again. At the end of last year I signed up for Uncommon Knowledge’s How To Stop Anyone Smoking online course. I have been a hypnotist for many years now and a practising therapist for about 10 and I found the approach in this course enlightening as it steps away from the norm, which is exactly why I really liked it. Having tested it out on several new clients, I can hand on heart say that it creates an excellent environment for building rapport and trust, it allows clients to explore the relationship with cigarettes from a very different angle and really digs into the fabric of the habit and lifts the wool that has been covering clients’ eyes. I can highly recommend it for any new or existing hypnotherapists as an awesome tool to add to your kit. The How to Stop Anyone Smoking system is based on the Uncommon Knowledge approach to smoking cessation. It’s a simple step-by-step process to make your smoking cessation clients into true non-smokers, developed over 15 years of training therapists, running smoking cessation workshops and 20 years of treating individual clients. You’ll be sent your login details for Uncommon U, our online training center. Within this private login area, you have access to discussion areas where you can ask questions, bounce around an idea with others to further your understanding of the information, or just chat with and get to know your fellow delegates. And support doesn’t end when the course does! From the day your learning commences, you will have access to Uncommon U for one year, where you can discuss your learning, get support and develop a community with other Uncommon distance learning delegates. There will also be monthly live Q&A calls with Mark. That’s where you can ask Mark whatever you like and he’ll reply personally – just as if you were talking on the phone. You can submit your questions beforehand, or live, and we’ll record the session and send it out to you if you miss it, or just want to refer back to it again. What’s included in the ‘How To Stop Anyone Smoking Course’? Comprehensive course notes – a 122 page workbook with overviews and summaries of each session, transcripts of the presentations and checklists to work through, sent to you by post if you opt for the Digital plus Physical version, and also available to download online. 5 audio lectures – which you can listen to in many different ways; on the CD you receive in the post (with the Digital plus Physical version), or download online to listen on your computer, tablet or phone. Real client treatment videos – watch Mark treat a challenging smoking cessation client using the Uncommon approach. Monthly Live Question & Answer Session with Mark -join your fellow students from this and our other courses to ask Mark questions about the course and any therapy-related queries you have. You can ask your questions live on the call or submit them beforehand and if you can’t make the live calls, they’ll be available to download the following day (in mp3 format). Dedicated course support – Kirstin, head of our Uncommon Care Team, will be on hand to answer any queries you might have, via email, telephone or within Uncommon U, our online training platform. Confirmation of 14 hours/points for your Continuing Professional Development. Our complete 10 Steps to Become a Non-Smoker Hypnosis Downloads program – including ten hypnosis scripts and ten hypnosis audio (mp3) sessions (a $294 value). An additional ‘mind setter’ MP3 session for your own use because if you’re in the right frame of mind, smoking cessation treatment becomes much easier. 3 ‘Audio Insights’ going in-depth into the psychology behind smoking – titled ‘Beating Addictions and Smoking with Hypnosis’, ‘the Utilization Technique’ and ‘Dealing with Resistance’ (mp3). So you’ve done the course and you’re ready to take down the tobacco industry, by hypnotically blasting addictions everywhere. You’ve had a few clients and you’re amazed at the success you’ve had. Well, we’re here to help. As a bonus, everyone who does the How to Stop Anyone Smoking course, will receive a FREE Client Attractor Pack. But once you get the resources you need from the Client Attractor Pack, you’ll be able to boost the numbers of smokers coming through your door. I loved the How to Stop Anyone Smoking course – it really gave me lots of new information and material to think about. I like the different ways the material is presented – some audio, some written and some video – and because you can go through things over and over again it is much more useful than traditional classroom teaching. Definitely worth doing. You designed the course with the user in mind, and it was blessedly free of academic psych-babble. I recently completed my MA in social psychology and my eyes now glaze over the moment I read dry academic rambling. This program was incredibly well written (a course that’s actually for humans!!). Uncommon U has utterly transformed the way I do therapy. Not that it’s about comparison to others, but I’m enjoying a much faster and higher rate of success than other therapists I graduated with. A client who was addicted to opiates (OxyContin) has now been clean for a month. His health, vitality, and mood have improved a hundredfold. As an interesting side effect of our three sessions together, he is also noticing a dramatic reduction in anxiety and has also quit smoking. This has been the most all-encompassing victory in my career as a therapist so far. There are no missing puzzle pieces in this course! From start to finish every detail is explained to you and provided to you in audio, video, and transcript. The support you receive for anything that might have been missed (and you’ll struggle to find much that isn’t covered) is second to none. The team are there to respond in a very helpful and friendly way. They respond quickly and go to great lengths to help as much as possible. I was bowled over by that in particular, as with online courses it can often feel distant. Usually, most companies take your money, give you the material…and then really don’t give a damn if you ‘get it’ or not. Not so with the team at Uncommon U! They care, they really care…and by the end of it you feel like you know them personally, which is very refreshing. Uncommon U have shown me a far better way to approach smoking cessation, a way that puts me on the same side as the client so I am working with them, not against them as I was before. They have provided me with everything I need in this course to provide the very best of care, support, and help to smokers and also helped me to feel completely different about that phone ringing! I can’t praise this course or the team highly enough. The stop anyone smoking course was just so different from anything else. So well presented and understandable. It’s not so much that it stops people smoking, as it stops people from BEING a smoker. That’s the difference this course has. I really enjoyed the training and felt that I learned a lot from the blend of written, audio and visual materials. It was particularly helpful in giving me an overview of what smoking is all about from the point of view of the smoker – we all “know” it’s bad for us yet smokers persist in defying logic and continuing to smoke. Unlocking the reasons why people smoke and learning a range of approaches to help the smoker work against the smoking were key elements for me. All done with the usual clarity, precision and humour which Mark and Roger bring to every course. I have worked with 3 clients since doing the course and all 3 are still non-smokers – the proof of the pudding I think! The course is wonderful. I’m just starting the second section. I am so thrilled that someone finally agrees that you can’t push smokers or expect them to respond after one session. I’ve been searching on my own to try to find some method that addresses the addiction/habituation without being so do-or-die, “you’re either ready or your not” judgmental, making the client wrong, insensitive, impractical and dismissive. So many therapists say that their smoking clients quit after one session. I’ve found that to be the exception so I ended up cringing in fear and confusion when I got a smoking client. I was so relieved to hear Mark say the same thing. I always knew that some kind of segmented approach was needed but I couldn’t get a firm handle on how to structure it. This seems really great and I’m already using it with a smoking client. It also seems as if it works for any other addictive/habituative behavior. Kudos to Mark and Roger. Please forward this to them. If I had the money, I would gladly pay twice as much for their courses and consider myself lucky. I’m very grateful. Susan French, Clinical Hypnotherapist, Encino, California. I really enjoyed doing this course and looked forward to each session I spent working on it. I found all the setting up instructions easy to follow and even fail proof…which for me is a big deal because it has been easy for me to get muddled up with following computer instructions in most other instances (I’m in my 50’s and only have basic computer skills at this stage). I really liked the check list at the beginning of each section… I got a buzz each time I ticked another step off and looked forward to the next step. In NLP we call this ‘chunking down’ and for me it had the effect of feeling steady progress. My ability to learn and retain the information was hugely aided by the multi-sensory system presentations – video presentations, audio and written and even kinesthetic with using the computer and ticking off the steps. I even liked the on-line tests for each section…they were relevant questions, achievable and the results are instantly available (very cool)! The approach of gradually separating the person (client) from the smoking as part of their identity totally makes sense to me and focussing on care and respect for the power of people’s beliefs is also congruent with my understanding of people. Melody Taylor from Taranaki, New Zealand. I’ve just completed your ‘How to Stop Anyone Smoking’ online course. Thank you so much for a compelling, well thought out, highly enjoyable, and informative programme. The content is presented in an easy to follow manner, is very engaging, and I especially liked how some elements are revisited throughout the different sessions. The Uncommon approach is certainly different to the way I was taught – as a regression hypnotherapist – however, I can’t wait to utilise the unique insights, tools, and strategies with my next smoking cessation client. Chris McFetridge, Certified Hypnotherapist, County Londonderry, Northern Ireland. Sherry Hardt, Certified Hypnotherapist and EFT Coach, Florida, USA. The materials are superb. I love the written material and being able to follow along with the video or audio while reading. It is perfect for my style of learning. Rather than taking notes, I can highlight and notate the written materials…fabulous! Also, love the full session recordings. Really, I cannot say enough about what I have learned, not just with this program, but others that I am taking as well as the wealth of information on your site and in your emails. I believe that I am listening more carefully and reframing. Reframing is so critical and while I do it, I found that I lacked confidence having never been a smoker, almost like I was a fraud, you know, “who am I to help these people quit!” But the program helped me understand the nature of the smoker and I believe the single most important factor that smokers have shared with me, that never came up before, is how “stupid” they feel for smoking and ashamed that they cannot quit by willpower alone. 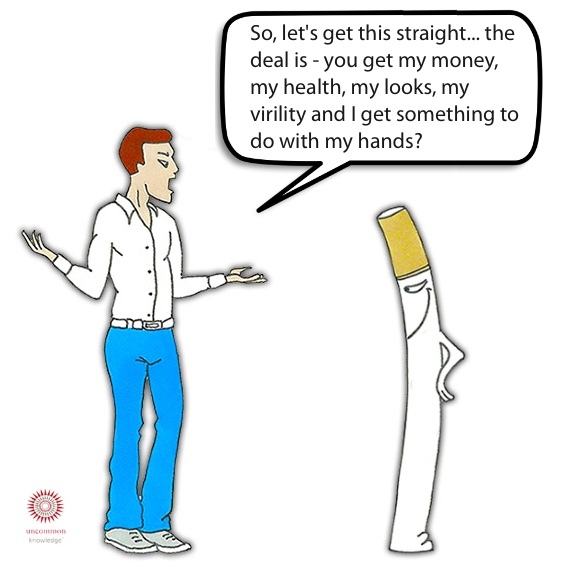 To free them from that misconception by helping them understand that the habit is a pattern of association and not a straight nicotine addiction, has freed each one of the guilt they felt and low self-esteem that developed around smoking. It is amazing. Rosemary Siple, Certified Hypnotherapist and Teacher of Consciousness Studies, Rehoboth, Massachusetts, USA. How to Stop Anyone Smoking’ is a course that changed the way I think, feel and behave about smokers. It made me understand the habit from the inside and gave me a new mindset about them. I knew this course was good before I took it, because some of the materials they used to market it made me quit smoking. So, after I saw that it worked on me, and it was only one good crafted metaphor, I thought this is it, this is a course I must have. So I had. And it was a great experience, from the beginning till the end. It is a new and creative approach, and its knowledge expands even beyond the smoking habit. I am still learning from this course and I’m sure I’ll find new things again and again. The very next day he left me a message that he is craving like crazy and I suggested we should meet again to talk about other stresses in his life. Well, as we approached the date of the next session, he left again a message telling me that after one day he couldn’t smoke, even if he wanted to. He had tried and the smoke made him feel sick. So, that’s my story and it made me feel good! Alina Tanase, Psychotherapist, Constanta, Romania. The course is very well put together, professional, and will appeal to all learning styles. My background is 20+ years in learning and development so it takes quite a bit to impress me! I would recommend this course to other therapy practitioners. It’s all good, assistance is easily accessible, Mark is welcoming and the materials are very professional. Janine Fowler, Clinical Hypnotherapist & Counsellor, Australia. The course was extremely comprehensive and I’m not sure how it could be improved. Love the way it is set out – easy to navigate, no time-wasting. It is all excellent content. It is not just how to, but why, so it makes sense and is easy to adapt to the client’s individual needs. The live demonstrations are incredibly useful. I have learnt so much from watching Mark in action. I also very much appreciated having both audio and text versions to study the material. I’ve found that most people only require one session with me using this material but it would be helpful to have even more ideas about how to deal with smokers who are particularly resistant. ‘I visited you nearly two weeks ago for a hypnotherapy session to stop smoking and I thought I would send you a quick update before I head overseas. Recently, I had a particularly challenging new client, who presented with a number of complex issues. She was seeing a psychiatrist and psychologist, but wanted to see me to stop smoking. Initially looking at the client on paper, I was concerned that smoking was the least of her worries and I wasn’t at all sure that I could successfuly concentrate just on her goal to quit. The strategies I learned gave me the capabilities to focus in on the smoking and cover it from several angles. As an off shoot, she reported to her psychologist that she had significantly reduced her drinking as well. Bonus points!!! Kim Hansen, Counsellor & Clinical Hypnotherapist, Sydney, Australia. Understanding the importance of reframing and metaphors have been real ‘aha’ moments for me too. As always (through all the courses) I am beginning to truly see and understand the vital importance of having our basic needs being met also. Rose Morgan, Christchurch, New Zealand. I’d just like to say how helpful I found the course when I had my client last Thursday – it really was a difference of night and day from the old approach I was using to help clients to stop smoking. I felt that I knew how to go about all aspects of the session – my client really seemed to benefit from it and I found the whole experience enjoyable. Having just had my first smoking cessation client, I can honestly say that the How to Stop Anyone Smoking course has given me knowledge, confidence, and a skill set that I haven’t had before. The session flowed well and allowed me to incorporate many of the learnings from the course in a natural way. For a short time of study with this course, I feel I have learned more than I did in two years of trying to understand what I would call the ‘bottom line’ of how this particular habit (smoking) can be understood, dealt with and eliminated. And I would highly recommend any courses from Uncommon Practitioners. Thank you both. I loved the layout of the course and the different ways of learning. 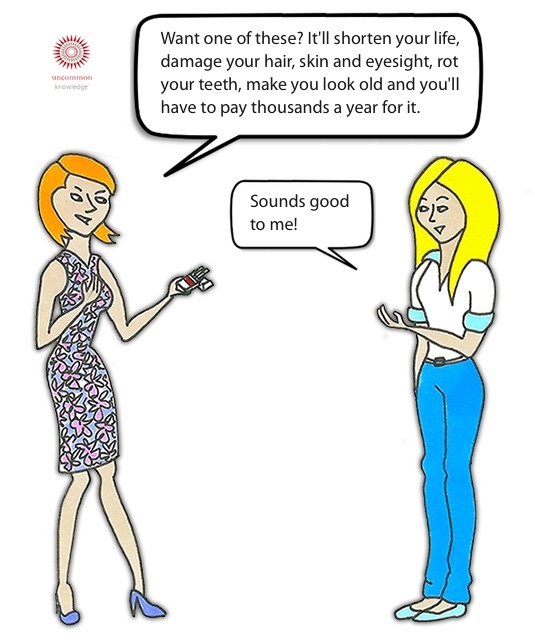 There are some great ideas and mind shifts on how to talk and understand smokers. Any questions I had were answered quite quickly and Mark and Roger are always willing to help you. There was full support in this course and for me this course was well worth investment as I’m always picking up new insights the more I go over it. I loved this course as it consolidated all the best re-frames out there to help clients stop smoking. The fact I can go back and review the material really helps strengthen my knowledge from what I’ve learned so far. Plus there is a lot of content and it will take time to fully assimilate it all. I feel much more confident speaking to potential clients about this topic now. Sessions are also more fun because I have so much more knowledge to draw from. Thanks Mark & Roger! I think the Uncommon U learning platform is fantastic. I’ve signed on for Uncommon Practitioners TV and so far love the concept. Being able to view therapy sessions (repeatedly) is of great value to me. It’s already increasing my confidence in several ways. I look forward to seeing the client commentaries. Steve Dodson, Clinical Hypnotherapist, Noosa Heads, Australia. Sally Gregoire, Clinical Hypnotherapist, Perth, Western Australia. Part of that goal is our promise that you will find treating your next three smoking cessation clients to be an effective and highly enjoyable experience – for both you and them! If not, simply let us know and we will give you a full refund. This session focuses on unhelpful and often untrue common beliefs about smoking, and how they contribute to the smoker’s excuses not to stop and provide a justification to smoke. You will also understand how to make subtle changes in the way your client thinks and feels about cigarettes. You will learn how to separate an unwanted activity from the smoker’s core identity and how to skillfully deliver reframes so that they are integrated into the smoker’s mindset. Sometimes, no matter how good you are at reframing, your client will have such set negative ideas and an endless stream of ‘yes, buts…’ that it stops treatment moving on in a helpful way. This session focuses on overcoming client resistance by building advanced levels of rapport. You have learnt some powerful ways to change a client’s compulsion to smoke and how the mind holds viewpoints that are linked to emotion. When you can get someone thinking about a future without cigarettes, you can start to build the emotion that will help to fix in new behaviour. In this session, we will look at creating a template for future behaviour without the old urge to smoke. You will learn how to increase your client’s expectation of positive outcome at the end of a session. You access the course by clicking the ‘Enroll now’ button at the bottom of the page. You can begin Session 1 straight away, during which you learn how to create rapport with your client, and understand the true nature of addiction. You listen to the audio lecture for the session and download the materials. You complete the short test at the end of Session 1, then you move on to Session 2, and so on through each of the 5 sessions. As you go along, you ask any questions you have in the comments boxes you’ll find on every page, or save them up for the monthly Q&A call. You continue through the course in this fashion until you have completed all five session tests. You continue to have access to the course materials online for one year, so you can check something or need a refresher. And if you choose the Digital & Physical option you’ll also have the course workbook and CD-ROM with articles and audio that we’ll send you by mail.